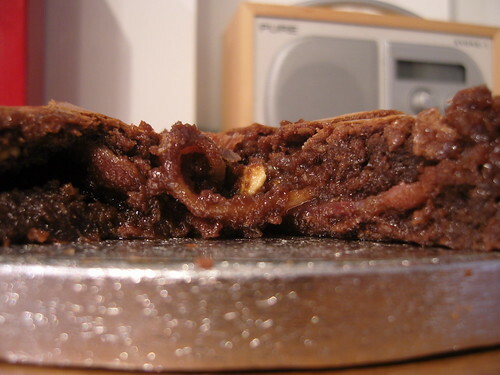 Last week I found an article about making bacon brownies on the wonderful Bacon Today site. I Twittered about it and also sent the link round work, like every good bacon loving girl should do. The response was rather shocking as loads of people emailed back saying how nice they thought they’d be! So of course I had to try and cook them to bring into work on Monday. Nothing like starting the week by managing to give the entire office food poisoning. 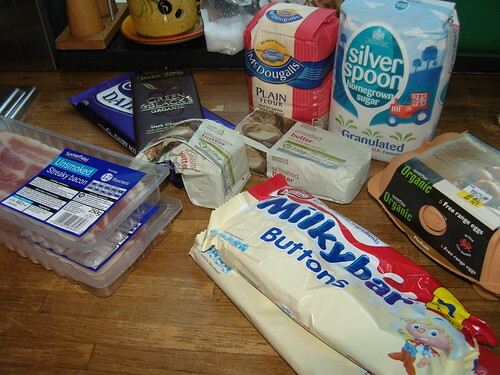 You don’t have to do anything more complicated than make brownies and chuck some cooked bacon in, though I diverted a little from the recipe on Bacon Today by making the brownies from scratch rather than using a ready made batter. 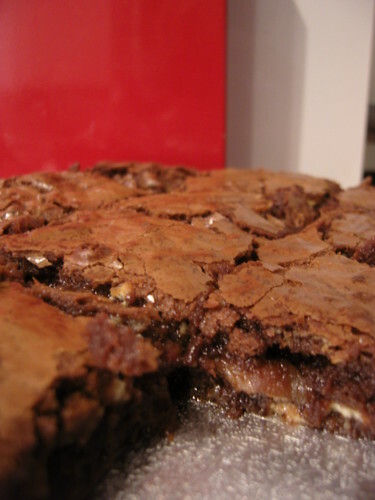 The resulting brownies are actually rather good, they don’t taste much different to normal brownies, they’re just a little saltier and have strange chewy bits in them. The bacon doesn’t add much depth to the flavour and it’s certainly not a new experience for the tastebuds, but at least you don’t gag on the first mouthful. I think that this recipe is by far the most interesting recipe that I`ve ever seen! Apart from them being anti semitic brownies, I can’t imagine how this was nice, but it deffo sounds interesting!! trust you to make bacon brownies, you complete weirdo. miss you! I am Helen Lawrence: Marketing Manager of New Platforms at ASOS (mobile, tablets etc). I was formerly Head of Social Media at Dare. I can be reached on helen dot c dot lawrence at gmail dot com.